Those who know their movie history are aware of the unusual relationship between Starman and E.T. the Extra-Terrestrial. Now imagine that Starman and E.T. had a baby. And imagine that the baby was the subject of a movie. But, someone made the mistake of entrusting the script to the baby and the baby forgot to bring the script to the set. That sounds like it would be a mess, right? Well, that's certainly the feel that I got from watching Midnight Special, a movie which vacillates between being a homage to those 80s classic movies about fugitive aliens and an incomprehensible snooze-fest. As Midnight Special opens, we learn that a young boy named Alton (Jaeden Lieberher) has been abducted by his father, Roy (Michael Shannon), and that they authorities are on the lookout for the two. The news reports make it all sound very sinister. And while Roy, and his accomplice, Lucas (Joel Edgerton), do have the boy, their goal was to rescue Alton from a cult which is run by Calvin Meyer (Sam Shepard). Alton is a decidedly odd child, who wears swimming goggles and sometimes headphones. Roy has to keep a close eye on the boy, as he's prone to strange spells where lights emit from his eyes. As Roy, Lucas, and Alton flee from the police and members of the cult, they are headed for a specific destination and Roy will risk everything to get Alton there. Meanwhile, Alton appears to be growing weak and ill. Midnight Special comes from Writer/Director Jeff Nichols, who also made 2011's Take Shelter. That film, which also starred Michael Shannon, was a Twilight Zone-like paranoid thriller which certain went down a science-fiction path, but found itself in more of a family-drama environment. In my review, I wrote that I felt Nichols had held back from allowing the film to fulfill its ultimate potential. Well, I apparently had no idea just how capable Nichols was of holding back, as he's barely delivered a movie with Midnight Special. As noted above, the film contains hints of previous films and elements of a specific story, but it never comes close to feeling like a complete movie. To add insult to injury, in the special features included on this Blu-ray Disc, Nichols admits that there are facets of the story which exist only in his head, and were not shared with the viewer. So, what we get is a movie which leaps beyond vague and enters a place where the audience feels locked out. We never learn anything about the cult, most notably how they were using Alton's powers, other than the fact that the felt that his powers made him specials. Speaking of which, we never learn the extent of Alton's abilities or when they first manifested. We never learn exactly why Alton isn't in the custody of his parents. (Although, we do learn in the extras that Nichols gave some of this information to the actors.) And, the finale is a complete mystery. So, clearly, Nichols isn't interested in details. What he is interested in is making a movie which has more than affection for Starman and E.T. Alton has never lived outside of the cult, so the world is new to him, much like Starman. He is traveling cross-country while being pursued by government officials, much like Starman. He shows signs of a mysterious illness, much like E.T. The movie even offers the sensitive government official who is more interested in understanding than capture, here played by Adam Driver. In order to make Midnight Special unique, Nichols has given Alton an "original" purpose and he shrouds the ultimate goal in mystery. 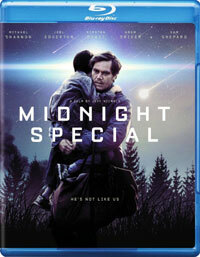 So, Midnight Special isn't what you think it is...except that it's exactly what you think it is. So, what do we have thus far? Midnight Special has a vague and confusing story and it's unabashedly "borrowing" specifics from some classic movies. Those two elements are pretty damning in and of themselves. However, the film's greatest sin is that it's incredibly boring. The lack of story leads to a lack of action which leads to a lack of interest from the viewer. When things do happen, they are incredibly uninvolving. I understand that for some viewers, the "why?" doesn't matter (and there is something incredibly wrong with those people), but if we don't know why or how, it's difficult to form any emotional attachments with the characters. You can't just simply present us with a father who is attempting to rescue his son from "something" and have lights shoot out of said kid's eyes and expect us to care. For those who are wondering, no the title of Midnight Special is never explained, just like everything else in the film. One thing is certain, that title is just vague enough to chase viewers away, as evidenced by the film's lackluster response at the box-office. If you recall, the film's trailer was intriguing, as it made us wonder what Alton's secret was. I've now seen the movie and I'm still wondering. Midnight Special thinks that it just have a kid explode and walk away without giving us a clue on Blu-ray Disc courtesy of Warner Home Video. The film has been letterboxed at 2.35:1 and the Disc contains an AVC 1080p HD transfer which runs at an average of 28 Mbps. The image is very sharp and clear, showing no notable grain and no defects from the source materials. Despite the fact that most of the film takes place at night, the image is never overly dark and the colors look fine. The picture shows off impressive depth, as the actors are clearly separate from the background, and the level of detail looks fine. The Disc carries a DTS-HD Master Audio track which runs at 48 kHz and an average of 4.0 Mbps. The track provides clear dialogue and sound effects. The stereo and surround sound effects shine during the finale, where we are treated to some detailed sounds. However, the track also shows some severe issues in balance, as the bass is far too loud in most scenes, overpowering the dialogue and music. I found myself having to ride the volume control, as the bass kept getting out of hand. The Midnight Special Blu-ray Disc contains only two extra features. "Origins" (13 minutes) is a series of five vignettes which focus on each of the main characters. These include comments from the actors and Nichols. The odd/ interesting/frustrating thing here is that there is talk of ideas, concepts, and character motivations which aren't in the movie. Nichols actually says, "The scene that happens, in my mind, that, obviously, isn't in the film..." Hey! We aren't psychic! Perhaps the movie would have been much, much better if you had put everything on-screen. I can't believe that producers would pay for anything knowing that the director is holding back. "The Unseen World" (5 minutes) has Nichols describing the very personal things which inspired the script.